We were absolutely fascinated and delighted when we first saw the Flowerpot Parasol in August 2013. 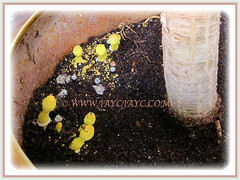 We assumed that the potted soil must have been overly wet and conducive for its emergence and healthy growth. Botanical Name: Leucocoprinus birnbaumii (syn. 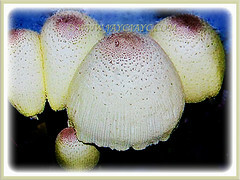 : Leucocoprinus luteus, Agaricus birnbaumii). 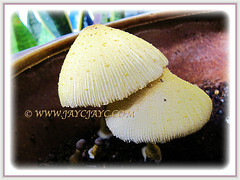 Common Names: Flowerpot Parasol, Plantpot Dapperling, Yellow Parasol, Yellow Pleated Parasol, Yellow Houseplant Mushroom, Lemon-yellow Lepiota. Etymology: The genus name, Leucocoprinus is from Greek Leucos, meaning white and Coprinus, the name of a genus that until recently contained all of the mushrooms commonly referred to as inkcaps. The specific epithet, birnbaumii honours the Czech garden inspector named Birnbaum who found it growing in a greenhouse in 1839. Origin: Native to tropical and subtropical regions of the world. It is widespread and common. 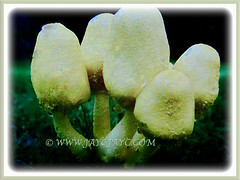 Plant type: An ornamental fungi. Features: Leucocoprinus birnbaumii is a species of the genus Leucocoprinus that consists of about 40 species. The Flowerpot Parasol is saprotrophic, living on decaying humus or compost. Flowerpot Parasol is perfectly harmless growing in flowerpots and does not affect the plant that it’s sharing pot space with. 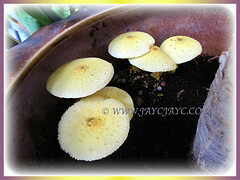 Leucocoprinus birnbaumii is a little saprobic yellow mushroom that is short-lived and pops up in flower pots alone or in clusters. It will drop dead by evening and decompose to become nutrients for the soil. The fruit bodies are mushroom-shaped. All parts are bright, pale sulphur-yellow that fades with age. 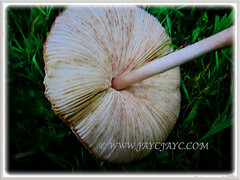 When young, the cap is usually oval, later becoming broadly conical or bell-shaped around 2.5-6 cm across. The bright to pale yellow cap is often darker at the center. The caps surface is smooth but dotted with fine, easily detached scales. It often develops shallow, grooves that radiate from the margin nearly to the centre. It is conical at first but expands to become more or less flat. It can sometimes have a central knob or be indented. The surface is often finely roughened. 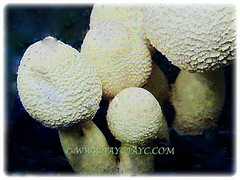 The yellowish gills are free and are covered by a partial veil when young, which ruptures to leave a fragile, evanescent ring on the stem. 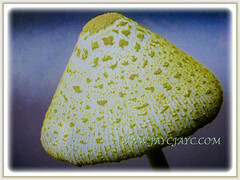 This unusually small mushroom, typically found on the soil of potted indoor plants, is easily recognized by a bright-yellow to fluorescent yellow (when fresh and fading rapidly to dingy and pale yellow in the sun), finely-scaled, bell-shaped, striate cap, thin and collar-like annulus. The surface is more or less smooth at the disc, elsewhere sqaumulose or matted tomentose. Microscopically, the species is distinguished by its thick-walled, ellipsoid spores that are dextrinoid and has a germ pore. The spores appear white in mass but are colourless and smooth under the microscope. Its flesh is thin, soft, fragile and unchanging. 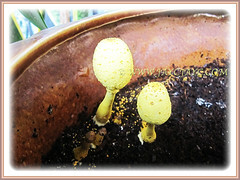 Culture (Care): Leucocoprinus birnbaumii or Flowerpot Parasol emerges in flower pots that contains a warm and very moist environment. Soil: Humus-enriched and very moist soils. Others: Since these beautiful gilled mushrooms sprout frequently in flower pots and other planter boxes, provide a shady, warm and wet environment for them to emerge and thrive. Beware that the Flowerpot Parasol’s fruit bodies are inedible and poisonous. If consumed, it will cause significant stomach problems. In temperate regions, Leucocoprinus birnbaumii or Flowerpot Parasol are commonly found to be thriving in indoor plant pots and greenhouses, even in the dead of winter. These lovely mushrooms emerges at any time of the year. It also appears in warm conditions in greenhouses, gardens and the edges of paths. They are most frequently spotted in hothouses in cooler climates. They are very common outdoors in southeastern United States, Texas, and other places where there are periods of hot, humid weather. They typically come around in late spring and summer, and seem to spring out of potting soil with an enthusiasm that is absolutely amazing. Propagation: By itself in a warm, very moist and humid weather. 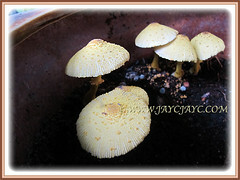 Usage: Leucocoprinus birnbaumii or Flowerpot Parasol is a spontaneous ornamental mushroom, commonly emerging in flowerpots with very moist soil. Ideal to be presented in the garden to display its beautiful form, very striking and bright colour. If you want to get creative, you may add a few animal or fairy figurines near them, like a little forest garden right inside your house.